No doubt most if not all of you are familiar with Hints from Heloise, that beloved newspaper column offering household thrift tips. Heloise has been around for almost 60 years now! (Actually the column was taken over by Heloise’s daughter in the 1970s.) The tips are as good as ever, and of course, what’s thrifty is oftentimes also green so it’s a double bonus. Today I offer you my own version, Low-Footprint Living Hints from LoLo-Ease. Domestic Science for the New Green Millennium! Eco Home Ec! 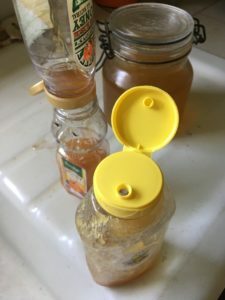 • When a jar of jelly or honey is used up, put water in the empty jar and shake it vigorously to clean out those very last bits of honey or jelly. The jelly-water or honey-water is a nice sweet treat, and the jar will be cleaner for the recycling bin. Sometimes I chill the jar of sweetened water in the fridge for an extra cool treat. • Peanut butter and oatmeal is a filling and affordable breakfast. When the peanut butter jar is just about empty, instead of having your oatmeal in a bowl as usual, put that day’s oatmeal and hot water in the peanut-butter jar, stir or shake, and eat your PB&O right out of the jar! For us green cheapskates, failing to use up that very very last bit of peanut butter would just be wrong! Also the oatmeal and spoon serve as a nice scouring material to get the jar clean for the recycling bin. 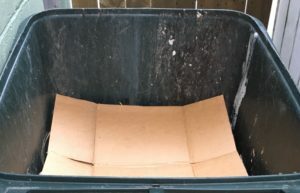 • Instant cover for the compost bin: flattened cardboard box. It makes a nice additional cover, besides the dried leaves and grass that you use to cover the food scraps to keep odors down and make the material break down properly. Over time as the cardboard gets broken down by rain, you can mush it into the bin with the rest of the compost and then replace it with another flattened box. By the way, earthworms love cardboard. And it’s always good to steadily use up cardboard boxes rather than keeping too many around your house and garage, as they are attractive to rodents. • Buy the toilet paper that has a paper wrapping rather than the one wrapped in plastic. It’s one less piece of plastic in landfill, and the paper wrapping is really good for cleaning the stubborn gunk out of your coffee cup (or for a greasy pan or plate, etc.). And you can toss it in the compost afterwards. Those are just a few of my personal favorites that I can think of off the top of my head right now. I’ll write more on other occasions as I remember them. If you’d like to share your favorite household green thrift tips with your fellow readers of this blog, feel free to email them to me. Be sure and let me know if you want me to include your name or initials, and city/state. Have a thrifty green day, and remember, the millions and millions of little choices we make each day have the power to change the world! I realize that some of you might feel that the tone and content of this post is inappropriately light. We’re dealing with a deadly serious subject here, after all: the impending collapse of our living environment; the possible imminent demise of human civilization, because of what boils down to human thoughtlessness and selfishness. The light tone of some of my posts might seem offensive to some of you. For those who prefer a more serious approach, I assure you I’m living it. But keep in mind that I’m trying to reach and motivate as many people as I can. And stay motivated myself! For those of you who’d like a bit more substance to balance out the light tone of today’s post, I offer you this article by Ron Meador in MinnPost, New outlook on global warming: Best prepare for social collapse, and soon. I’m here to help you prepare for the possibility of societal collapse. Ideally, best case scenario, to prepare ourselves so we AVOID societal collapse. And much of the preparation involves boosting our inner resilience. Humor and the ability to take pleasure in small things are valuable qualities to cultivate as we move forward into uncharted terrain.